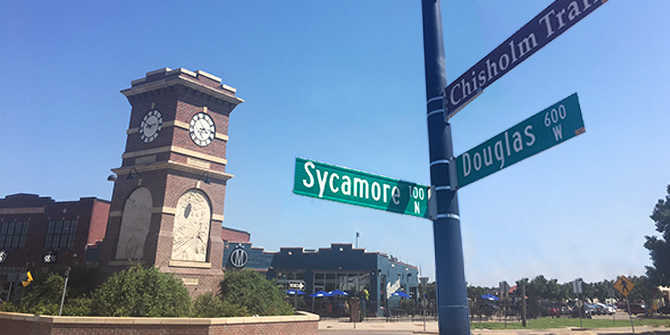 The last time the Historic Delano District held a Fall Fair was 2003, when the neighborhood west of the river in downtown Wichita celebrated the completion of its streetscaping project and new clock tower. The 150th anniversary of the Chisholm Trail was cause for another celebration, said Delano volunteers Nancy Lawrence and Mary Lou Rivers. “Wichita was the largest cattle town on the Chisholm Trail,” Lawrence said. “About 60,000 head of cattle came through,” Rivers said of the drives that started in Fort Worth and steered cattle north to market during the 1860s through 1880s. The two are among a group of volunteers and business owners planning to celebrate that rowdy legacy with the Delano Fall Fair - A Chisholm Trail Celebration Oct. 6-8, 2017. There will be nods to Delano’s disorderly past – brothel tokens will be sold as souvenirs and there will be a reenactment of the Running of the Doves, though the saloon girls will be wearing bloomers during their race from the river. However, the fair is very family-friendly and has no admission charge. Free parking is available at Lawrence-Dumont Stadium and on residential streets south of Douglas. The Delano Fall Fair is a great time to explore this revitalized neighborhood. Shops, restaurants and bars will be welcoming fair-goers, and in addition to the great restaurants that line Douglas in Delano, there will be fair-style food vendors selling items like turkey legs and roasted ears of corn. Truth is stranger than fiction! Sit around the campfire and hear the stories of real Chisholm Trail cowboys and early Wichita settlers and their lives on the frontier of the Old West. Hot dogs, s’mores, hot chocolate and apple cider available. Vendors, cowboy food, Mexican fiesta, old-fashioned games, storytellers, horses and longhorns. A western parade of horses and horse-drawn vehicles from the clock tower east to McLean Boulevard and south to Maple Street. Watch as the saloon girls are carried down McLean from Douglas, part way to Maple where they will strip down to their bloomers and race back to Douglas. Cowboys will hoop and holler for the ladies and the race winner receives a prize. Enjoy old-fashioned ice cream while being entertained by a Jesse Chisholm look-a-like contest and beard & mustache contest. Prairie Rose Rangers on the main stage.